We like you summer, we really do. But as any man in the northern hemisphere knows, looking good while standing in a puddle of your own sweat is a task that borders on the impossible. And when it comes to an inevitable rotation of warm-weather events, it isn’t just the fancy ones that force you to pick between wringing out your three-piece suit by mid-day or showing up in denim cut-offs. Fortunately, rather than continue to let men choose between being unstylish or uncomfortable, Marks & Spencer has struck sartorial gold with its latest tailoring collection, offering the broadest choice of fits and styles anywhere on the high street, all in smart, breathable fabrics. Fronted by brand ambassador, male model and all-around style god David Gandy, the line-up of suits, shirts and shoes, flanked by other sharp wardrobe staples like chinos and polo shirts, will allow you to traverse the entire spectrum of smart and smart casual dos from now until autumn. And quite possibly beyond. Unless you hail from a particularly chilly part of the Arctic (or Scotland), it stands to reason that summer nights demand an entirely different wardrobe to those in winter. Even on balmy evenings, and especially at events such as a smart casual party, you’ll still want to look put-together. 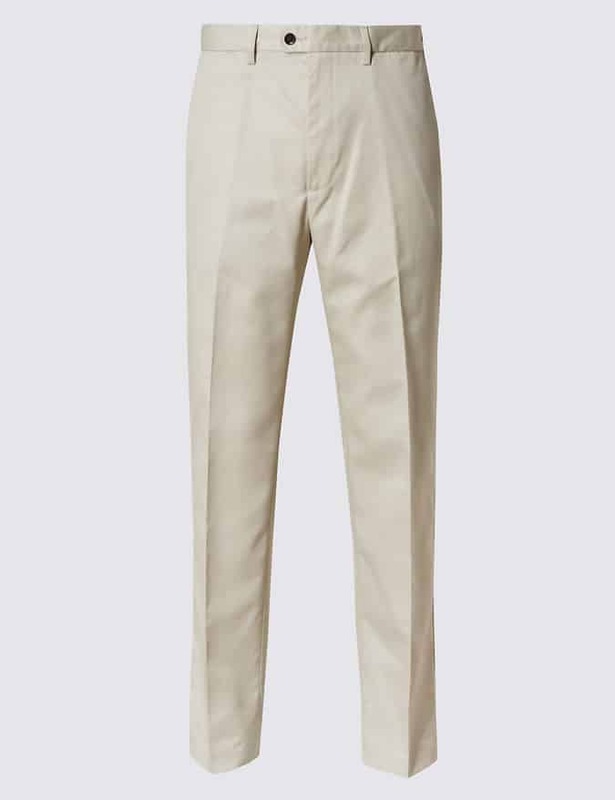 Rather than resort to shorts and flip-flops, lean on the tried and tested team of chinos and a T-shirt, then throw over a textured suit jacket to smarten up and fend off any breeze. The beauty of jetting off to a sunnier clime is that it affords you the opportunity to loosen up with your daily looks. That said, unless you don’t plan on leaving the hotel (or are staying at a nudist resort), you’ll still need to be able to upgrade from sweaty, poolside attire. This sort of dressing can be tricky to get right in the heat, but by opting for tailored shorts, paired with a breathable linen-blend shirt that also works for the 9-5 and finished with loafers and sunglasses, you can effortlessly tackle high temperatures in high style. Provided the invitation permits, and doing so doesn’t upstage the groom, summer nuptials are the perfect place to showcase a bit of sartorial flair. As well as the details, the devil here is in the fabrics, unless you actually want to melt into a puddle by the time the speeches begin. Despite commonly being associated with the cooler months, a wool suit is an astute choice on account of its ability to regulate body temperature and wick moisture away from the body. Finish with a neatly knotted tie and smart Derbies and no guest will be to resist saying ‘I do’ to a dance. Selecting the least offensive novelty jumper for the office Christmas bash is a tricky business. Equally, the work summer social comes with its own set of style dilemmas – chiefly that you don’t want to show up looking like you’re dressed for a meeting, but a string vest is unlikely to go down well either. The answer? Aim to hit the sartorial mid-ground with separates. A casual jacket worn with smart trousers provides a solid foundation that can be dressed up with a tie or down by showing a bit of mankle. Other than weddings, there are few other events in the summer calendar that require you to get suited and booted like a day at the races. Outside the Royal Enclosure, of course, dress codes have followed the rest of menswear and relaxed, so you can afford to give your suit a summery twist. A straightforward way of doing this is to swap out the traditional shirt for something more laidback, but no less natty. A polo shirt fits the bill perfectly thanks to its collared design. Framed by a sharp two-piece in a lighter shade and modern monk strap shoes, the result is a finish you’ll want a photo of. You can shop the full M&S tailoring collection now in stores and online at marksandspencer.com.